Logistics Force (CTF 73), homeported Sasebo, Japan. Litigation Areas: Drug Products Liability, Personal Injury, Medical Malpractice, Commercial Law, Military Law, Employment Law, Immigration Law, Real Estate, Landlord-Tenant. By Donald J. Farber, Esq. This website is an attempt to familiarize the reader a bit about myself and the issues that affect my law practice. While I try to be polite, civil, and give others the benefit of the doubt in personal and business relationships, I do not pull punches when I think something needs to be addressed directly. No "political correctness" or pulling punches emanate from this law office--and that is the same way I approach life in general and implement my law practice. The late ABC sportscaster Howard Cosell described this approach: "Tell it like it is!" At 67, I am gathering my "second wind" professionally--or maybe the third or fourth-as I seek justice for every client whose representation I assume. I have not had my head buried in legal texts or talked politely to judges all my life. Law is my second--or maybe third or fourth--career. Son of a school teacher and raised in rural Illinois, I went to a teachers' college, didn't study much, cut a few classes, and graduated with a B.S,. getting by on those days’ standards” which were called "gentlemanly 'C's." Looking for adventure, I joined the Navy, there finding my niche. Save 6 months when I left active duty for a boring civilian job, I spent the next 25 years traveling around the world, fighting wars, sailing the seas on the bridges of ships, doing very interesting things, and, as always with the government, doing too much oppressive paperwork. I was no war hero; just a regular naval officer doing my job. Along the way, I've done interesting things: negotiated with communists, been plucked out of riotous mobs in Greece by the Sixth Fleet, led hurricane rescue efforts in Haiti and Fiji, participated in submarine rescue efforts, dined with prime ministers and ambassadors, and was the "accused" at an Admirals' Mast in Norfolk, Virginia, shaking in my boots as I stood at “attention.” I worked as an underwriter for an insurance company and, many years later, after retiring from the Navy with the rank of commander, worked for four (4) years as a diplomat with the U.S. Department of State in Taiwan administering arms sales to the Taiwan Navy. If you asked me how to characterize my experience and background before becoming a lawyer, I would probably say "jack of all trades—master of none." Since becoming a lawyer in 1993, I’ve taken on various type cases, and found the discipline, logic, and curiosity in the law to my liking. More recently, in the last 6 or 7 years I have come to represent a high number of antidepressant victims, opening up a new chapter in my quest for knowledge and understanding. Marrying above myself, I married a beautiful Chinese woman in 1971. and together we raised two daughters--or I should say, my wife did most of the rearing as I was gone a lot at sea. Fortunately, my daughters don't hate me for the absences--or so they tell me. Among our residences over the years, in addition to Virginia and California, we lived overseas 13 years in Taiwan (twice), Japan, the Philippines, and Fiji. My "start" in the law was in 1969 in the Navy when, as a non-lawyer, I was assigned to defend a 20 year old Gunners Mate in a court martial. The young sailor, despite heroic combat actions in Vietnam earlier, deserted upon return to the States for the love a beautiful divorcee 10 years his elder. The young AWOL (“away without leave”) gunner, completely in love, was finally tracked down by the Shore Patrol, who had been tipped off on his whereabouts. Rather than surrender, the young sailor jumped out of the woman's 2nd story window and tried to run away from the Shore Patrol. Caught, and brought back in handcuffs, things looked gloomy. The sailor was charged with desertion and appeared to be a good candidate for a bad conduct discharge. The young sailor initially expressed his reservations over my assignment as his defense counsel. He did so because of my reputation as a stern disciplinarian. He thought I was in on trying to “hang” him just like the accusers. After a long talk with the young man, I convinced him I would be just as zealous in trying to get him "off" as I had earlier been in meting out punishments to wayward sailors. It worked. He agreed to keep me as his attorney. I even convinced the by now very conflicted young sailor he could still have a future in the Navy. The trial, as it turned out, was relatively easy. Making the best case for the young gunner at trial, or so I was told by the 5 members of the courts-martial, no "brig time" was awarded, with the sailor effectively getting off with a slap on the wrist, being allowed to stay in the Navy. "This is not so difficult" I thought after the trial, and concluded "the law" was a logical mechanism for whatever limited skills I possessed. I was hooked after that on the goodness a lawyer is capable of contributing to when the circumstances allow. 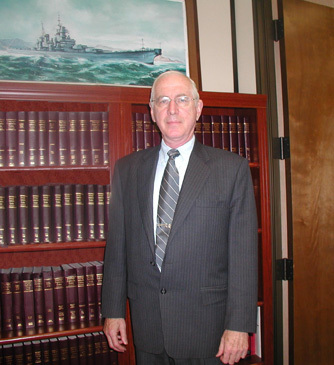 I started law school, at night, before retiring from the Navy, and finished after I completed an assignment in Taiwan. Since graduating from San Francisco Law School in 1993 and starting my own practice the same year, I put out my shingle and took on general civil work. Areas included personal injury, medical malpractice, immigration, family law, employment law, military law, business disputes, landlord-tenant, legal malpractice defense, and products liability defense. The first antidepressant case in personal injury came my way in 1999. It was a Paxil case. A 35 year old married father of two young children, with no history of untoward behavior, and indeed a model of hard work and virtue, was directed to take 10mg daily of Paxil. Three days later, the wife came home from work and discovered her husband's body and the bodies of her two children, all floating in the family bathtub. I knew instantly Paxil was responsible--and my seven (7) continuous years of research and litigating antidepressant cases since has only re-enforced that conviction. For these past seven (7) years, antidepressant personal injury law has comprised over 90% of my practice. I have been an attorney of record and/or represented antidepressant victims in about 35 states. At last count I have represented 26 clients in antidepressant suicide cases, those being surviving heirs of suicide victims or those who survived a suicide attempt after starting an antidepressant. In a mass tort case involving the antidepressant Paxil and approximately 3000 plaintiffs, the law firms of Baum Hedlund and Yourman, Alexander, & Parekh of Los Angeles, Pendley Law Firm, of Plaquemine, Louisiana, and I, combined to litigate claims for those victims. I was a member of the Plaintiffs' Steering Committee ("PSC") on the case, called "In re Paxil Products Liability Litigation (MDL No. 1574 (MRP), in U.S. District Court, Central District of California. I take cases that I find interesting. Except in certain narrow areas of the law, I feel a good lawyer can take on a case of any kind and do a good job. Curiosity, hard work, and determination always pay off. That does not mean your client always "wins" and that the opponent always "loses." Sometimes both sides "win" (they settle their dispute), and sometimes not. In the old TV series "Barnaby Jones" where Buddy Ebsen played the LA detective--and always caught his man, he was told by a frustrated cop who didn't catch the killer, and had the wrong man "You got lucky!" Barnaby replied: "I've found in my career the harder I work, the luckier I get." So it is with lawyers, too.